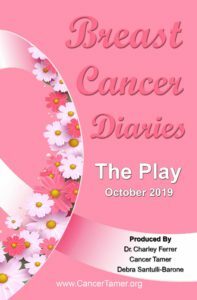 Breast Cancer Diaries is a a compilation of stories of women (and men) who’ve been diagnosed with breast cancer; sharing their thoughts, fears, and voices, including voices from those who are no longer with us. 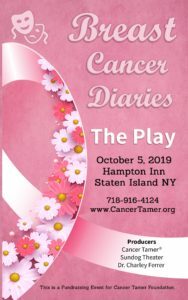 Though breast cancer is one of those topics people want to sweep under the rug, this “dramedy” will share a little bit of drama and a whole lot of comedy, reminding you of the conquering spirit that is within us all. Whether you’re the one diagnosed, man or woman, friend or medical provider, Breast Cancer Diaries will provide you with new insights and leave you with hope for the future…and hope for a cure…as it reminds us of the power of love, faith, and that there’s more to women (and men) than this disease. 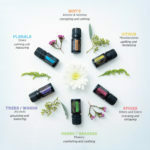 Breast Cancer Diaries is perfect for women and men (with or without cancer), their families and loved ones, as well as medical physicians, holistic practitioners, and anyone who works with–or plans to work with breast cancer. On a side note: we are also looking for individuals who would like to be interviewed and share their story for the Play and upcoming book; as well as appear in our upcoming videos: Faces of Breast Cancer & Messages of Hope. Email us for more information. Early Bird Discount tickets on sale. VIP/Cast Party includes:Play, DJ dance party, cash bar, special goodie bags, and more!